Manila - Several malls released mall hours schedule for December 25, 2013, Christmas Holidays including December 30-31 and New Year (January 1, 2014). 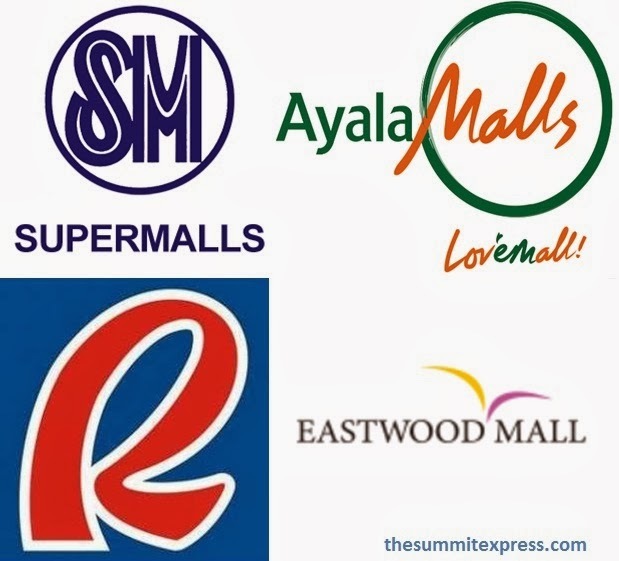 Check out the list of shopping malls that are open on holiday 2013: SM Supermalls, Greenbelt, Glorietta, Powerplant, Market! Market!, Greenhills Shopping Center, Robinson's Mall, Bonifacio High Street, Eastwood and other malls. SM Supermalls (nationwide) are open on December 25-30 from 10 AM to 10 PM. Shortened hours of operation will be on December 31 at 9:00 AM to 7:00 PM schedule. SM is still open on January 1, 2014 from 12nn to 9PM. However Mall of Asia said that mall hour is extended on December 25 and will be closed at 11:00 PM. Robinson's Mall also released nationwide mall schedule. Shopping mall is open from 12:00nn to 9:00 PM on December 25; 10AM to 9PM on December 26-30 and 12:00nn to 9:00PM on January 1, 2014. December 26-30: 11 a.m. to 11 p.m.
December 31: Greenbelt 1: 10 a.m. to 6 p.m.; Greenbelt 2-5 : 11 a.m. to 6 p.m.
January 1: 10 a.m. to 8 p.m.
December 25: 12 noon to 9 p.m.
December 26-30: 10 a.m. to 9 p.m.
December 31: 10 a.m. to 6 p.m.
January 1: 12 noon to 9 p.m.
December 26: 11 a.m. to 9 p.m.
December 31: 11 a.m. to 6 p.m.
December 25: 10 a.m. to 9 p.m.
December 26-30: 10 a.m. to 10 p.m.
December 25: 12 noon to 8 p.m.
December 31: 10 a.m. to 8 p.m.
January 1: 12 noon to 8 p.m.
December 25: 9 a.m. to 10 p.m.
December 26-30: 9 a.m. to 10 p.m.
December 31: 9 a.m. to 7 p.m.
January 1: 12 noon to 10 p.m.
December 25: 12 noon to 10 p.m.
December 31: 10 a.m. to 9 p.m.
December 25- 30: 11 a.m. to 11 p.m.
December 31: 10 a.m. to 7 p.m.
January 1: 11 a.m. to 11 p.m.
December 26-30: 11 a.m. to 9 p.m.
December 25 : 12 noon - 8 p.m. Note: Only the Shang Cineplex, food and beverage establishments in Main Wing Levels 5 & 6, and East Wing Lower Ground Level, Levels 4-6 will be open. December 30: 10:00a.m. to 9:00p.m. December 31: 10:00a.m. to 7:00 p.m.
December 26-30: 11 a.m. to 10 p.m.
December 26: 11 a.m. to 10 p.m.
December 27-28: 11 a.m. to 11 p.m.
December 29: 10 a.m. to 11 p.m.
December 30: 11 a.m. to 11 p.m.
December 31: 11 a.m. to 8 p.m.
December 25-30: 10 a.m. to 10 p.m.
January 1: 10 a.m. to 9 p.m.
January 1: 12 noon to 6 p.m.
December 25: 12 noon to 9 a.m.
Share now this post if you find this informative. Happy holidays! Like Us on Facebook or Follow Us on Twitter for more updates.